What makes the Upper East Side special to you? 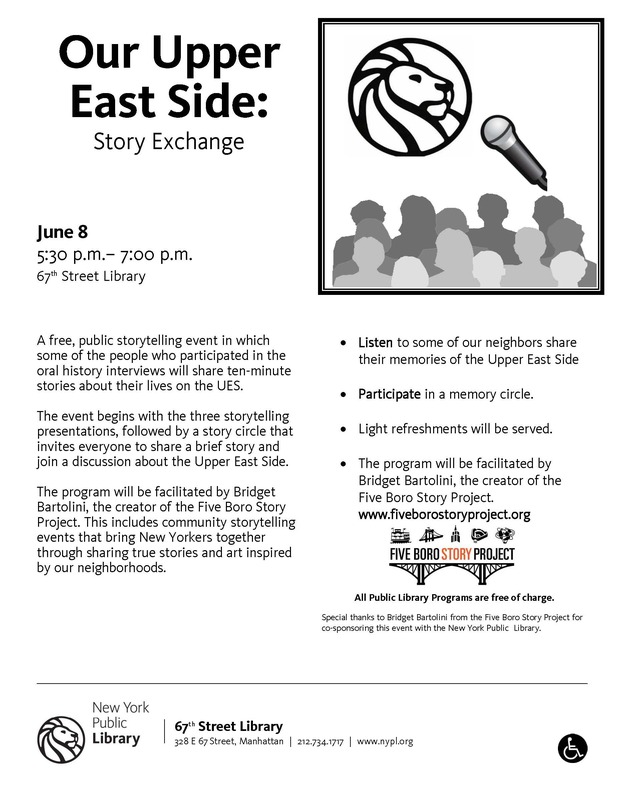 Join the discussion, and hear and share stories of the Upper East Side with people who know it best! Sarah Woodside Gallagher is a veteran of the entertainment business and has been an Upper East Side resident for – can it be true? – 48 years! Harris Healy, President of Logos Bookstore, grew up on the Upper East Side at 98th Street and 5th Avenue, and has been running his bookstore on York Avenue for 20 years. Rima Roy, parent of Rayat Roy (age 11) and Nishtha Roy (age 8), came from India as a college student 25 years ago and has been an Upper East Side resident for over 12 years. Following the performances, share your own memories and stories about the Upper East Side in our story circle. The 67th Street Library is located at 328 East 67th Street between 1st and 2nd Avenue. The closest train station is the 6 at 68th Street – Hunter College.